The outer layer of your skin consists of dead skin cells - it's a protective layer designed to protect the delicate living cells of the deeper layers of skin. This layer of skin needs to stay moisturized to protect the deeper layers of skin. In order to keep the moisture (water) from leaving the outer layer of skin, the skin produces natural oils. These oils also help keep irritants away from the deeper layers of skin. Regular washing with soap or exposure to chemicals can remove these natural oils. When the natural oil is stripped from the outer layer of skin the moisture (water) quickly leaves the outer layer of skin leaving the skin dry, irritated, and itchy. Worse, the deeper layers of skin are left exposed to harsh damaging substances including detergents, solvents, cleaners, paint and thinners, gardening chemicals, dirt and grease, latex gloves and powder, etc. This results in more dry, irritated, and itchy skin that becomes chapped, cracked and damaged. Hand and skin lotions only replace natural oils with artificial ones. These offer temporary relief that does little to heal the skin. Regular use of lotions can actually cause the skin to produce less natural oils. 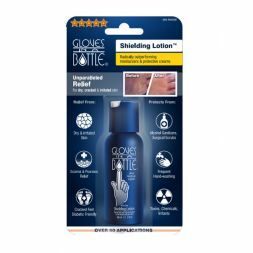 Gloves In A Bottle is a shielding lotion, it bonds with the outer layer of your skin and protects it from irritants while locking in your natural oils and moisture, the reason why dermatologists recommend Gloves as an effective dry skin treatment.